"Sampath Speaking" - the thoughts of an Insurer from Thiruvallikkeni: FIFA timing ~ BRT; IST; Greenwich; UTC ~ and Greenidge shouldered arms !! FIFA timing ~ BRT; IST; Greenwich; UTC ~ and Greenidge shouldered arms !! In India, it is IST (Indian Standard Time) ~ after independence, the Indian government established IST as the official time for the whole country, although Kolkata and Mumbai retained their own local time (known as Calcutta time and Bombay Time) until 1948 and 1955, respectively.The Central observatory was moved from Chennai to Allahabad District, so that it would be as close to UTC +5:30 as possible. IST the time observed throughout India and Sri Lanka,; it is calculated on the basis of 82.5° E longitude, in Shankargarh Fort (25.15°N 82.58°E) which is nearlly on the corresponding longitude reference line. In our school days, have read about – Greenwich, a place in South East London, England; notable for its maritime history and for giving its name to the Greenwich Meridian (0° longitude) and Greenwich Mean Time. The town became the site of a royal palace, the Palace of Placentia from the 15th century. The biggest sporting spectacle of the World – FIFA 2014 is all set to start and you can almost hear the roar from Arena de Sao Paulo. A world away, Indian fans will have a tough time choosing which match to watch, given the post-midnight timings. The first match between the hosts Brazil and Croatia is at 1.30 am, Friday June 13. The lead-up to the FIFA World Cup 2014 has official broadcaster Sony Six sweating bullets to ensure that the extravaganza lives up to its name and all the fan frenzy around it. The ball was already set rolling a while ago when the channel launched its “Live the Magic” campaign. As for advertisers for the World Cup, Hero MotoCorp is already on board as presenting sponsor and Xolo Mobile and Microsoft as powered by sponsors. The 2014 FIFA World Cup will be held from 12th June to 13th July in Brazil. A total of 64 football games will play at 12 venues during the tournament. With 32 nations battling it out on the football field, fans in India would be happy as Sony Six will broadcast 24 games out of 64 matches live during the prime time slot of 9:30 pm. Here are timing in India for the first 5 matches. The opening game @ 01.30 am on 13th June for us – actually kicks off on 12 June 2014 at 17:00 clock (BRT) in São Paulo, which is 3 hours behind UTC …. UTC – what ? UTC is - Coordinated Universal Time (French: Temps Universel Coordonné, UTC), the primary time standard by which the world regulates clocks and time. It is one of several closely related successors to Greenwich Mean Time (GMT). For most purposes, UTC is used interchangeably with GMT, but GMT is no longer precisely defined by the scientific community. UTC was officially formalized in 1960 by the International Radio Consultative Committee in Recommendation 374, having been initiated by several national time laboratories. The system was adjusted several times until leap seconds were adopted in 1972 to simplify future adjustments. The current version of UTC is defined by International Telecommunications Union Recommendation (ITU-R TF.460-6), Standard-frequency and time-signal emissions and is based on International Atomic Time (TAI) with leap seconds added at irregular intervals to compensate for the slowing of Earth's rotation. When high precision is not required, the general term Universal Time (UT) is used. Greenwich Mean Time (GMT) originally referred to the mean solar time at the Royal Observatory in Greenwich, London, which later became adopted as a global time standard. GMT was used especially by bodies connected with the United Kingdom and commonly used in the United Kingdom and countries of the Commonwealth, including Australia, South Africa, India, Pakistan and Malaysia, and many other countries in the Eastern Hemisphere. Before the introduction of UTC, Greenwich Mean Time (also known as Zulu time) was the same as Universal Time (UT), a standard astronomical concept used in many technical fields. 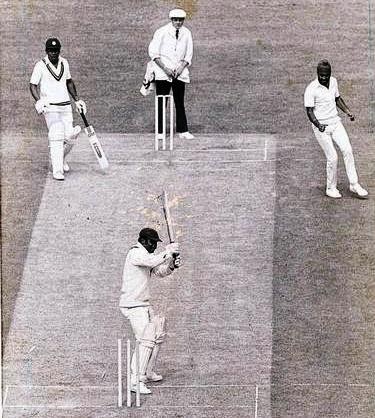 Away, Greenidge was more popular to cricket fans …. One still vividly remembers his shouldering arms and getting bowled to that banana inswinger of Balwinder Singh Sandhu on 25th June 1983. CG Greenidge (Cuthbert Gordon Greenidge) was an explosive opener who made his debut at Bangalore in 1974 and continued playing till 1991. He partnered Desmond Haynes making 6482 runs together in Tests. Greenidge played 108 Test matches scoring 7,558 runs with 19 centuries and 128 ODIs, scoring 5,134 runs and 11 centuries. Those with keener eye on the game would remember the other tall Greenidge (Alvin Greenidge) too, who played in six Tests and one ODI from 1978 to 1979. He opened in that Chepauk Test when Kalicharran captained WI in the tour in 1978.